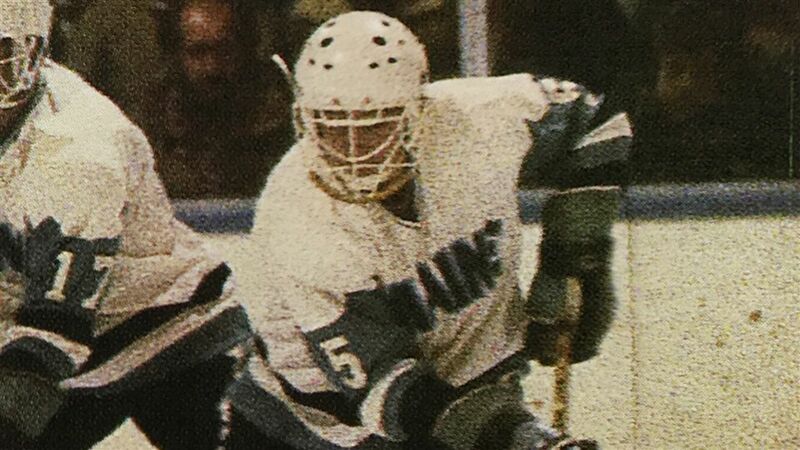 ORONO, Maine -- Ray Jacques was one of the building blocks of the University of Maine ice hockey program, first as coach Jack Semler was laying the foundation and then when Shawn Walsh had his sights set on raising it to another level. Moreover, Jacques is still involved with the program, more than three decades later, as an enthusiastic supporter of UMaine hockey overall and, incidentally, as the father of a player with the continually improving women's ice hockey program. Strictly by the numbers, in 125 career games, Jacques racked up 46 goals and 82 assists for 128 points, twice topping the Black Bears in scoring during his four seasons. As a senior, in 1984-85, he was nominated for the Walter Brown Award as "New England's best American-born Division I college hockey player," awarded annually by the Gridiron Club of Greater Boston "to the player who best combines the attributes of sportsmanship, skill and team spirit." The key to Jacques' game, and life, lies in those last four words: "skill and team spirit." "The same thing that makes him an outstanding person is what made him an outstanding player," says Semler. "He's as enthusiastic as the day is long." It also didn't hurt that "he could skate like the wind and had terrific hands," says Semler. Gary Thorne, who did play-by-play of Maine hockey and was involved with the Friends of Maine Hockey in those days, pictures the same player that Semler describes. "The overall image I have of him is that he always provided a spark," says Thorne, who now does TV play-by-play for the Baltimore Orioles. "As a player he was a solid guy who got tossed out there in tough situations. Highly reliable, he provided an offensive spark, or a needed defensive play." Jacques recalls his days at UMaine fondly, starting with the first time he visited. Jacques had wanted to go to Yale, and been recruited by Yale, but couldn't get in. The Yale coach, Ben Smith, "told me, 'Ray, you're not going to Yale. You can't spell your own name'," says Jacques, exaggerating. Any disappointment was dispelled when he "saw a game at Maine and couldn't believe it," Jacques says. "The noise in Alfond Arena before it was expanded was unbelievable. I called my dad, 'this place is unbelievable'." He had played at Matignon and then as a postgrad at Kimball Union and was heavily recruited, but was sold on Maine and became "a feather in our cap," says Semler. Jacques is equally complimentary of Semler, Walsh and UMaine. A highly successful financial advisor in Peabody, Mass., Jacques says, "I run my company like a hockey team. Things I learned from Jack. Things I learned from Shawn. "Jack taught me accountability. Can you look yourself in the mirror? "Shawn was a little more of a motivator, good at getting in your head. "Everything I have done in my life," says Jacques, "stems from what I learned at Maine. Jacques' father, Raymond, and mother, Virginia, were enthusiastic supporters of their son and Maine hockey, and Ray is an enthusiastic supporter of his daughter, Jessica, a junior forward on this year's UMaine women's team. "I told her, 'Don't go to Maine just because I went there'," says Jacques. "She just loves the place, loves the coaches, the kids, the trainers. It's been just great." "One game in particular. There were forty-one hundred there, the doors were closed. We were tied. Providence was the big whoop those days. With about a minute left, I had the puck on the wall. Todd [Bjorkstrand] was wide open by the net. I got the puck to him and he one-timed it. I still remember how loud it was. One moment, I've never forgotten. The sound had nowhere to go. I've never heard anything like it, nothing since, not even Boston Garden with fourteen thousand people."